$4,359.00 This may be in stock for quick delivery; please call! The Holton TR183 single rotor bass trombone offers superb response throughout the entire bass trombone range. Founded in Chicago when Frank Holton opened a small instrument shop in 1898, The Frank Holton & Co. grew to one of the most influential instrument manufacturers in the first half of the twentieth century in the US. Today, the tradition continues with high quality trumpets, flugelhorns, and trombones being hand-crafted in Elkhart, Indiana, and in Eastlake, Ohio. 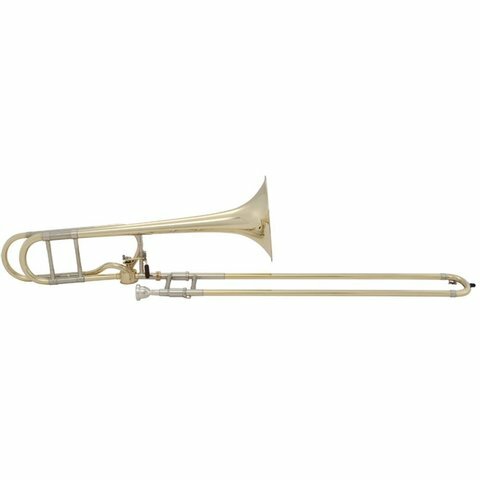 The Holton TR183 single rotor bass trombone offers superb response throughout the entire bass trombone range. The .562" bore combined with the traditional wrap F section and 9" professional red brass bell offers a controlled response with a warm, rich sound. The chrome plated nickel silver inner handslide tubes provide the ideal surface for smooth and quick handslide action. The clear lacquer finish adds a subtle warmth to the sound overall. The Holton TR183 professional bass trombone is ideal for both symphonic and solo performance. Available in silver-plate finish as TR183S. Holton - .562" bore, key of Bb/F, 9" rose brass bell, traditional wrap F attachment with single traditional rotor, nickel silver out slide, silver plated finish, Holton 1-1/2G mouthpiece, CTR183 woodshell case.